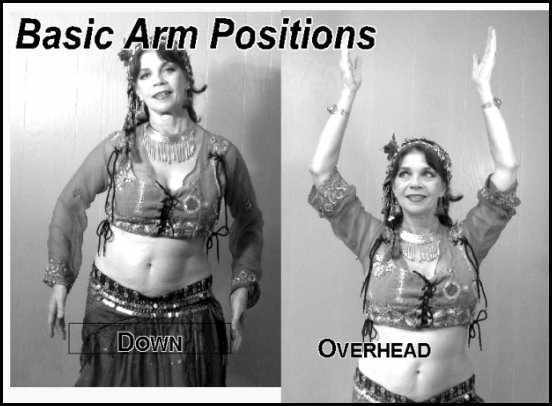 Three Steps to Beautiful Belly Dance Arms! Expanding from our last two articles on Arm Positions, we have seven basic (and beautiful) arm positions to use while dancing. 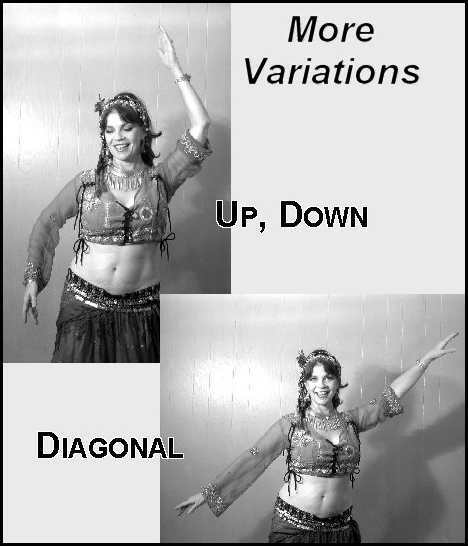 These photos show the Basic Positions and their Variations (note that several poses can be reversed to the opposite side, not shown). This article will take your arms from Basic to Beautiful in 3 easy steps! To learn the basic positions well, pick only two arm positions to focus on in a short dance combination of your own creation. I’ll leave the music and tempo up to you - just use music you like or want to dance to. For instance: 4 counts of a smooth hip movement (like a figure-8 or hip rolls), then 4 counts of a sharp hip movement (like lifts or thrusts); then repeat that 8-count segment for a total of 16 counts. Remember we’re focusing on the arm MOVEMENT between poses, which is the "Transition". Make your TRANSITION between the sections quick and graceful - with no wasted movements. So you’re thinking all this sounds suspiciously like a drill too? 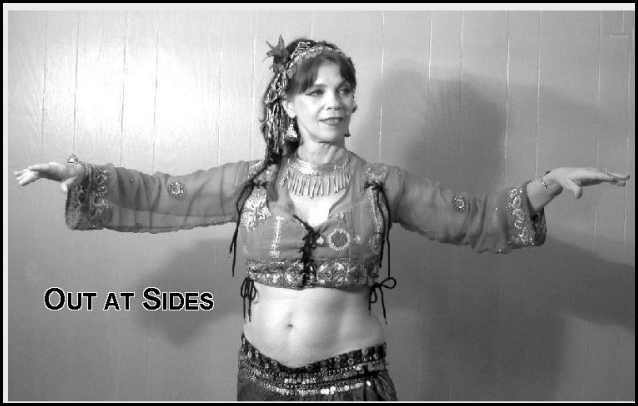 Well, it is in a way, but you can turn drills into dance by using a few “performer secrets” like smiling or changing expressions; turning or tilting your head; facing different directions, as I did in the photos, instead of just blankly staring at yourself in the mirror! Try it and see what a difference those little secrets make! Break your 4-count sequence up into 3 + 1, for instance, using the figure-8/thrust example, instead of doing each movement for 4 counts as we did above, do your figure-8 for 3 counts, and finish with a thrust on count 4. Voila - instant pizazz! Now you can repeat that combination (including your arm positions), until it’s familiar and comfortable, but WITHOUT sacrificing any of the good technique you’ve been working on. Your focus is on Position, then Transition to (another) Position. This step is more complex but a lot of fun - and, if you can feel the momentum of your arms as they move through space it can open up a new dimension in your dancing. Dancing is about feeling, after all, and when a dancer can not only move but also enjoy the movements, it has a powerful effect the dancer as well as the audience! The next article explains how an advanced or professional dancer uses arm movements, complete with video!